We have found some unforgettable horse riding holidays in Turkey. Explore ruined castles and elaborate palaces reminiscent of ancient empires; diverse backdrops of snow capped mountains, rich agricultural valleys, open steppes, extensive sandy Mediterranean coastline and vibrant cities - all on Akhal-Teke, Arabian and Turkish horses. Most of our rides are in Cappadocia which derives from the ancient Persian phrase "the land of beautiful horses" so there couldn't be a more appropriate destination for a riding holiday. The landscape is unique and there are many wonderful villages, historic sites and important towns along the way. Ultimately however it is the kind and hospitable people you meet that make these trips so special. 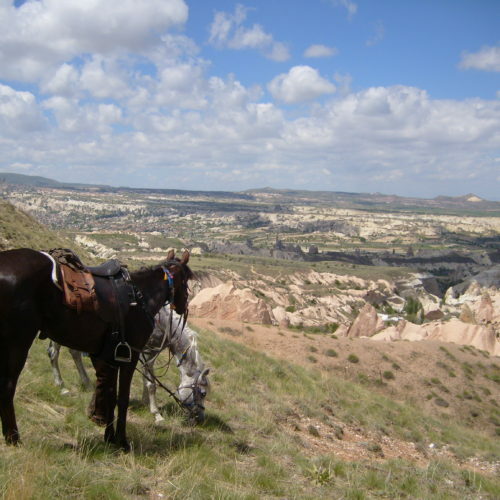 Experience the beauty of Cappadocia from horseback. Choose to explore this unique landscape with a choice of camping or hotel based rides. Whichever itinerary you decide upon be sure to see the distinctive rock chimneys.